At long last, here is an update on what has been keeping us busy this spring! 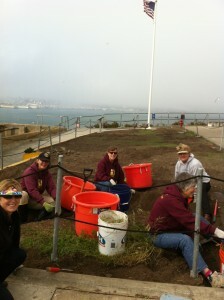 The biggest project we took on was renovating the lawn in front of the cell house, at the very summit of the island. Keep in mind, when I say ‘summit’, you have to envision the harshest possible place to try to grow anything. This little patch of lawn, about 3000 square feet in size, was last renovated 10 years ago when it was planted with sod and had irrigation installed. Over time, weeds had worked their way into the lawn and the lawn had become more weeds than grass. 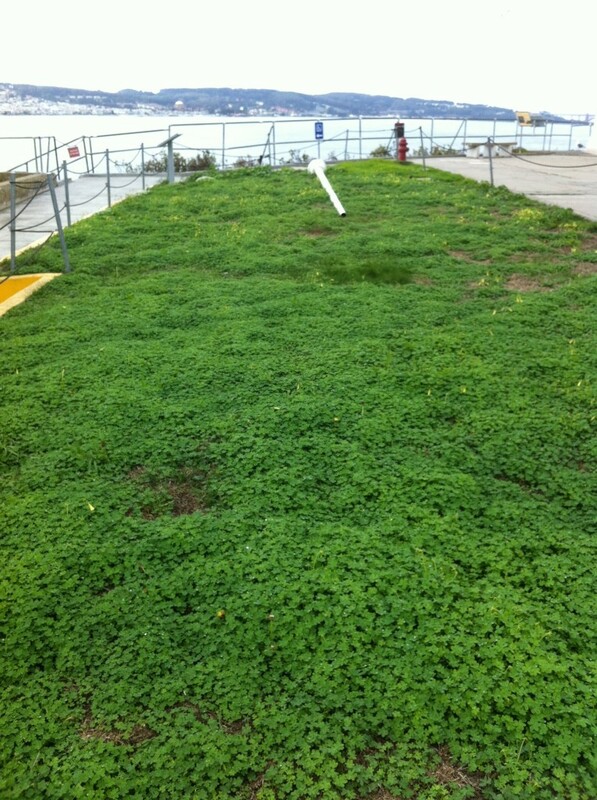 The biggest culprits were Bermuda grass and oxalis, with the odd dandelion. Even the irrigation had never worked properly. During the summer months, the wind blows so strongly that the water from the irrigation nozzles was literally blowing away. Regular watering had become a hand watering task done by the limited National Park Service maintenance staff. For a brief time, the cable fence surrounding the lawn was removed and the lawn was trampled by the heavy foot traffic of the daily 5000 visitors. The cable fence was put back, however, the concrete used to hold the fence posts in place was poured over the irrigation valves! It was inevitable that the lawn failed. The National Park Service, seeing the wonders of the now thriving gardens that had sprung from the overgrowth under the care of the horticulturists on the garden crew, were hopeful that the lawn could have a similar outcome. 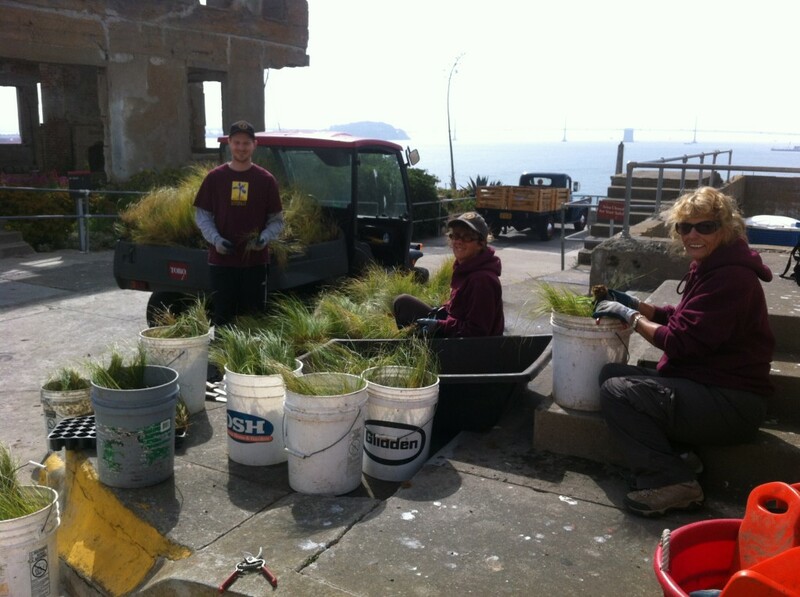 Meanwhile, one of our other projects underway is to renovate the historic west lawn using drought tolerant grasses. This project has been in the works for two years now as we are using a cardboard sheet mulch to smother the oxalis and annual weeds. 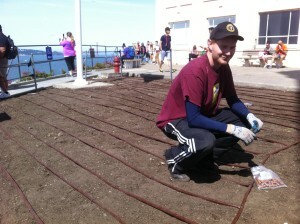 For the lawn at the summit, we did not have the luxury of leaving a bare patch of ground for two years. Even if we did, I’m sure the mulch and cardboard would blow away! 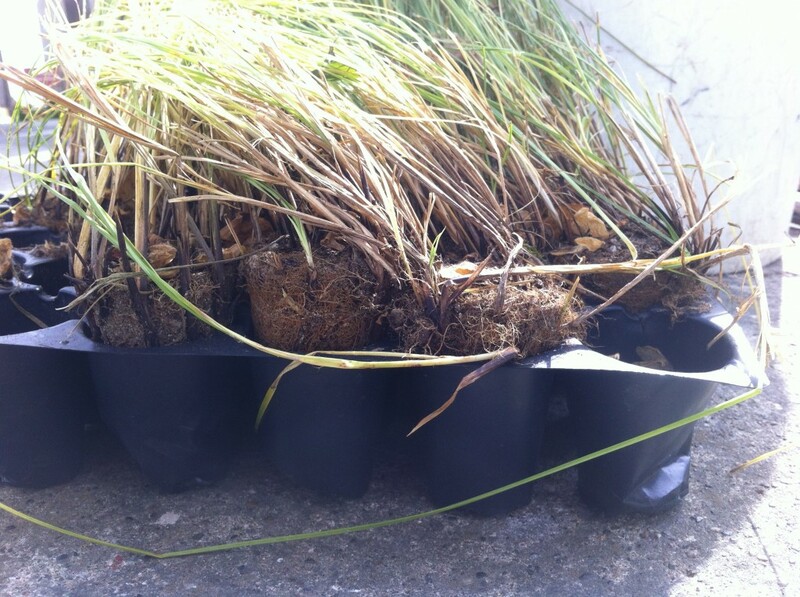 Using crews of volunteers, we hand-weeded the lawn and hand-picked buckets of oxalis corms. Our most common question from visitors was ‘what were we looking for?’ It was always tempting to say ‘bodies’, but we stuck with our story of weeding oxalis. Next, we dug out the old irrigation system. It was no surprise to see concrete poured over the emitters, no wonder why this system had never worked! After two months of weeding, we added an entire pallet of chicken manure. Again, we got a lot of attention from our activities. 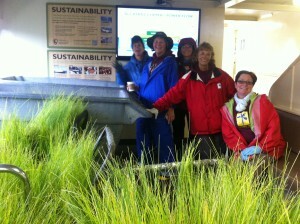 It was amazing to see how many people were sensitive to the smell of manure (especially kids). Leveling off the area, we dug trenches for the pvc pipes that would feed our new irrigation of Netafim drip lines. (I’ll leave out the step of purchasing the wrong pvc pipe diameter and hauling them to the island, only to return to them to the mainland and then go buy the right diameter). about three days. We wanted to lay the lines about a foot apart and have three zones that could be turned on/off separately. Laying the network of lines in a grid pattern was easy, it just took a little bit of time to cut and connect the T-connectors. One of the problems with the old system was that there was not enough pressure to have good coverage as the water was spraying. Netafim already has emitters built into the lines that do not clog with soil. The lines can actually be buried and they apparently will still not clog. 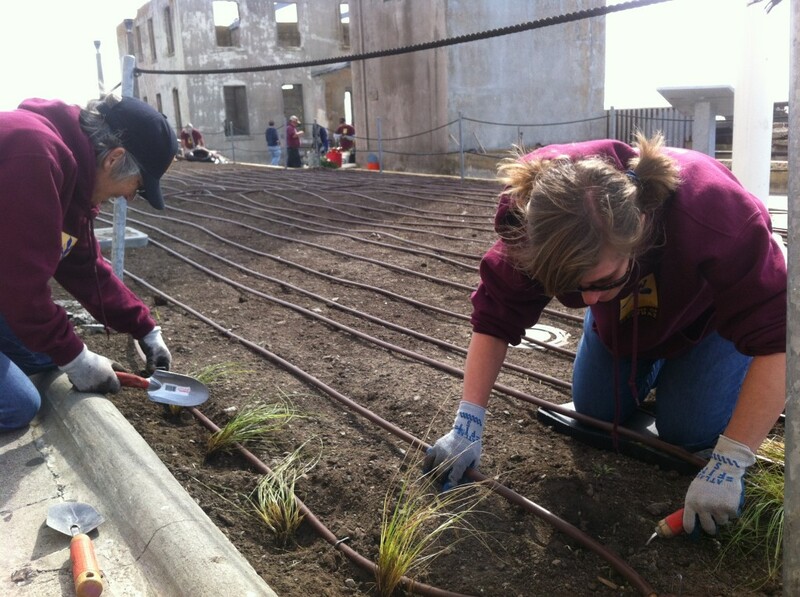 Our lines are laying directly on top of the soil and the grasses will grow over them, so eventually they will not be seen. We encountered the usual problems of discovering a broken water pipe that feeds the irrigation box – likely cut from deep shoveling oxalis corms, running out of T-connectors and needing to buy more, and of course the wind picking up every afternoon and making it unpleasant to work on the lawn. as growing from seed would have taken too long. We purchased a few flats of plugs from California Flora Nursery that were fantastic. However, there were not enough to finish the job and I needed to buy more plugs. The rest of the plugs were of very poor quality and were very root bound in the packs. The volunteers had to spend extra time to cut the strangling roots away, soak the plants in water and then to finally plant them. We did have a little assembly line going and it was a really good group activity (we so rarely all get to work side by side anymore). So far, so good with the lawn. The little plugs have some new shoots on them and will eventually fill in. The seagulls have only pulled out a few plugs that are easily replanted. 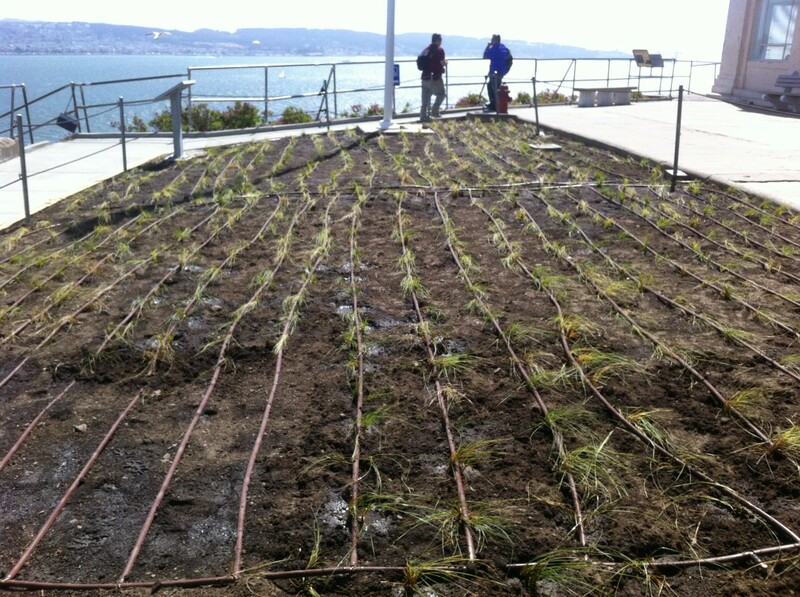 Hopefully by summer of next year, Alcatraz will boast a drought tolerant lawn that will be an example to people from around the world that you can have a lawn that does not use precious fresh water.